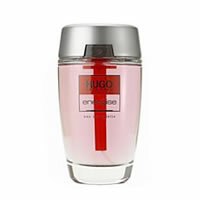 Hugo Boss Hugo Energise contains fluid fruits and contrasting spices that impart an instantaneous freshness bound together by a dark woodiness. Hugo Boss Hugo Energise is a stimulating and invigorating fragrance for active men that donates a longlasting lift to mind body and soul. Hugo Boss Hugo Energise combines aromatic, aquatic and fruity essences of Pepper, Kumquat, Melon, Coridander, Freesia, Amyris, Sandalwood, Ambrette Seed and Nubuck Leather.